as you're busy planning your thanksgiving menu, here's a little treat to make you drool! after thursday, when you need a break from all things pumpkin and turkey, try making this rich, salty, sweet dessert. this recipe is adapted from an old issue of Food & Wine magazine and we decided peanut butter was a perfect addition to the pretzel and chocolate combination. check out the latest post in our mad props series here - a warm german scene with gold crackle plates, weisswurst and sauerkraut. finally got to the new amsterdam market for the smorrebrod table 2010 and the rye bread project which was great! also got to meet fellow big leo food stylist Heidi Johannsen and taste some of her delicious and beautiful tea from Bellocq. in the bowl of an electric mixer fitted with the paddle attachment, beat butter with 3/4 cup pretzels and confectioner's sugar on low speed until creamy. beat in flour and eggs. add remaining 1/2 cup pretzels and mix, leaving some pieces intact. flatten the dough between two sheets of plastic wrap and refrigerate until chilled, at least 30 minutes. preheat oven to 350 degrees F. roll out the dough between the sheets of plastic wrap to a 12-inch round. peel off the top sheet and invert dough over a 10-inch fluted tart pan with removable bottom. press the dough into the corners and patch any tears. trim the overhanging dough and refrigerate for 30 minutes. line the shell with parchment and pie weights or dried beans and bake 30 minutes. remove the parchment and bake 8-12 minutes more or until firm and set. let the shell cool completely. using a small offset spatula, spread the peanut butter into a thin even layer and refrigerate while making the chocolate filling. in a medium saucepan, bring the cream to a simmer. turn off heat and add chocolate, let stand 5 minutes. whisk until completely smooth. let filling cool slightly before pouring into the shell and smoothing with spatula. sprinkle with sea salt and refrigerate until set, at least 4 hours. holy yum. This sounds unbelievable! Pretzels and chocolate?! That's interesting. I have to try it! Una receta perfecta! Deliciosa tarta y fotos! can i ask what size tart pan you used? 10-inch tart pan (now written in the recipe) - thanks! 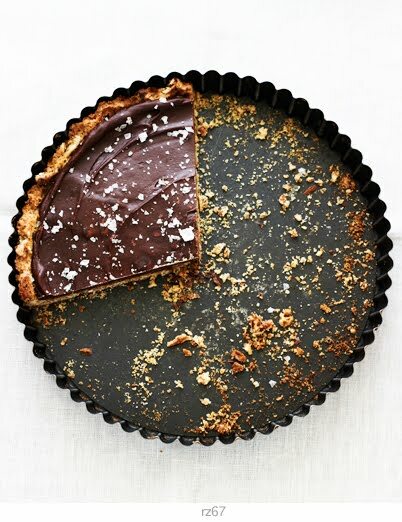 love a bit of salt with my chocolate - fabulous recipe! Holy moley that sounds delicious! Ooooo I really want to make this!!! Your pictures are just divine. Not sure about the combination (not a peanut butter fan) but can feast with my eyes. who doesnt love a chocolate covered pretzel? In tart form, very classy. oh my goodness i am frothing at the mouth. chocolate + peanut butter + pretzels brings tears to my eyes. I have a serious weakness for pretzel and chocolate. Salt and chocolate mmmm. That looks so great! And easy to put together. Do you use salted or unsalted pretzels? I'm note sure what to say about this recipe until I've tried it, but the combination sounds pretty delectable. This could be the kind of thing that you say you're just going to try once and end up getting hooked for life... like a gateway dessert. This looks absolutely delicious :o) I shall be giving it a go! thanks for this great post., and free recipe.., i want to try this. This pie will be part of our Christmas Eve spread. Thank you! I love cooking especially for Holiday seasons. I'd love to try this recipe this New Year as we'll invite Michael Geffrard to come over our house. He is a businessman who is also into baking and I wonder what his comment would be with this dessert. Thanks again for sharing! Now that I've seen it, I can't believe I have never thought of pretzels as a pie crust. Awesome. I just stumbled across your blog, really like it! This recipe look amazing and combines all things favorite! Thanks for sharing...I can't wait to try! Amazing! Love this idea. Thanks for sharing. Just discovered your blog. I'll be back for sure! I made this using almond butter instead of peanut butter (I'm not a peanut fan) and it was divine. I love that sweet and salty contrast. Your photo is beautiful as well! Hi! I'm form Poland and i have a little question..
Could you tell me, how many graam is 1 stick butter?